In addition, these patented products contain a superabsorbent gel layer positioned between the PU foam layer and the backing film. Aside from resulting in significantly improved cushioning, this gel layer pulls excess wound fluid out of the foam layer, which greatly improves the dressings' ability to keep wound fluid away from the fragile periwound, particularly when held in a vertical plane. 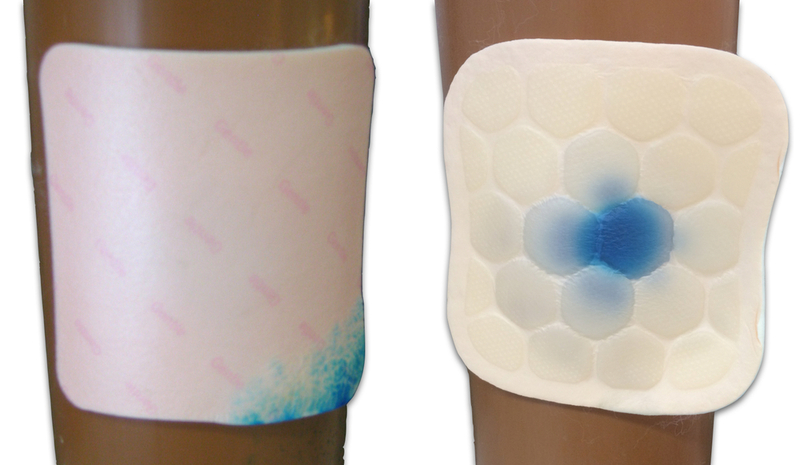 The following image demonstrates the flow of synthetic wound fluid (coloured blue) on a typical foam dressing (left) versus a borderless Superfoam design (right). We have a range of designs in development, supported by full CE Technical Files. These are available with your own artwork. We can also produce bespoke size/ shapes/ designs. Please contact us to discuss these products, and availability in your market, in more detail.